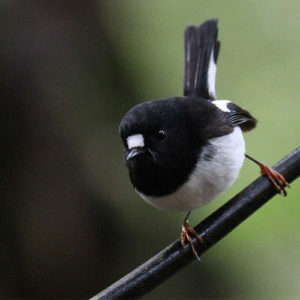 The white chested tomtit is endemic to New Zealand and you can find good numbers of them in our forest. They are quiet birds most of the year but in about August we hear them start calling loudly indicating that the breeding season isn’t far away. The tomtit is a small bird, about 13 cm long and weighing in at only 11g. Each tomtit pair may raise up to three broods during a season, from September through to January. They can become very vigorous in territorial defense. You will find the tomtit in native habitats such as in forests and scrubs like the Canopy Tours forest. They were nicknamed by the Maori ‘torotoro’ for it’s habit of appearing from nowhere in the forest. The tomtit played an important role in old Maori rituals. They were known as the ‘lovebird’ as they were the go-between when a husband wanted to get a wife back due to the belief that it had ‘influence’. The miromiro would be sent by the husband as a messenger and it would fly to her and settle on her head. The charm would begin to work and she wouldn’t be able to resist the tomtits powers and gently be propelled back to her husband.